Today we visited one of the most jaw-dropping chapels I have ever seen. 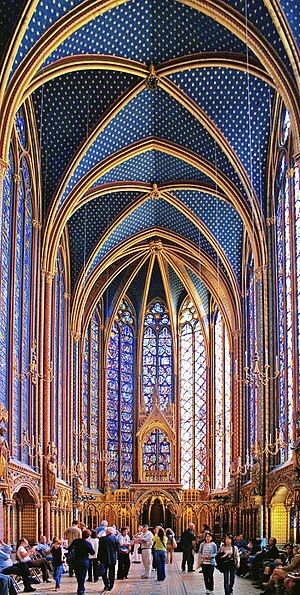 Sainte-Chapelle on the Ile-de-la-Cité is a gem of high Gothic architecture enlightening it’s visitors with spectacular stained glass windows that seem impossible to have lasted for almost 800 years. Amazingly, the seemingly delicate and fragile windows have withstood a great deal of turmoil within the chapel during the revolutionary period and almost by an act of God, have remained intact. Illuminating the sun-filled chapel with rich reds, deep-sea blues, sparkling greens, and glistening golds, the windows and the stories they tell come alive with passion and emotion, just like the relics they once housed. How incredible! I will definitely have to go there someday.Looks like the most spectacular church in the world!! !